So I now learned my lesson and prepare my food the night before. I haven’t done much of exercise this first week because I am still getting my tummy get use to this. I worked out few days but keeping it moderate. My starting weigh was 113.4 lbs. waist 31 in. I measured this morning and I am 112.9 lbs. waist 30 in. After a week, not much change in weight loss but that wasn’t what I was aiming for. I am feeling good about this IF because my tummy feels the best. I don’t feel bloated period. Another good thing is that I don’t feel like I am being controlled by the food. Week 2 goal is to add few good exercise. I got my husband & my friend to do this together and they are doing great too! I’ve gained few pounds here & there and my kangaroo pouch is coming back! So I have decided to start IF today and it’s going so far so good! I broke my fasting with a banana at 1 PM, then my lunch at 2:15 PM. I am now making my gourmet Pho for dinner, planning to eat before 8 PM and I will be done for today! I am really looking forward to this new habit! Also, my husband will be doing it with me together, so I am really excited about this! My total intake calories after my gourmet pho dinner is about 1300 today so that’s pretty awesome. I took some photos of my hideous body today so, I will update on April 1st! My starting weigh today is 113.4 lbs. waist 31 in. I drink at least 3 liters of water per day. This is the year of “PIG” and I am a pig!!! It’s also my dad and grandpa’s birth year as well. Although I am not very close to my dad, I still wish him the very best. Tagged: 2019, 1-1-2019, 1/1/2019, First Day 2019, New Year, New Beginnings, New Chapter, Year Of The Pig, Happy New Year! I cannot believe today is the last day of 2018! It’s been one of my most difficult and also a productive year ever. I am really thankful for everyone around me and all the goodness that happened around me. I believe all things happen for a reason and there is always right time for things to happen. I have been patiently waiting for this and I am more than grateful for where I am. Thanking endlessly for the shelter, food and great health I now have. So here are my goals in 2019. This is all I can think of now but if I remember, I will add more. I hope everyone a HAPPY NEW YEAR! And be thankful for everything you got! My shoot today was amazing! All leaves had fallen off the trees and color from the branches are definitely showing. I’ve been sick since last Sunday but I managed to still work few more days before my long holiday weekend! So proud of myself to have such a great report and I am still motivated to do better. Life is good, I am so thankful for everything. Last night few of my co-workers and I had dinner and desert time in Bellevue, it was nice to have people with good heart to chitchat with! And we are in November, only leaving 52 days? until 2019! I am so busy, but happy at the same time, finally catching up with my life! Hope to see some colors left by next week! What a sweet beautiful this girl is, this night will always be remembered. I see the calendar and it’s October! I have been busy yes, still struggling but hoping it will be OK by the new year! I am trying to be positive about everything and hoping thing’s will turn out well. Praying and hoping my New Year will be a good year! So looking forward to 2019!!! It's raining tonight and it feels so good! Hope everyone is safe around all this fire! We went to Rattle Snake Ledge hike last week and it was so easy! Trying to keep myself strong and think positive as always. I don't know where my June went??? I am trying to hike as many as possible but time doesn't permit. I can't believe it's June already! I am already into my second month at my new job!!! All is going great, great environment, friendly co-workers, I can't wish anything more. Last night, I met this cute doggy charging towards me at the park. Life is a hurdle and we just need to keep running and embrace what we have! Be happy everyone! It's JUNE!!! So we have decided to go on a long walk, well, not "we" but more like "I", LOL! Anyhow, we had really great time today walking & viewing beautiful surroundings! My husband and I really enjoyed getting out there every morning for a morning walk. Looking at all the flowers around the neighborhood has been more than entertaining! On Monday the 7th, I will be starting a new full time day job! Yay! I am still pursuing what I love to do which is photography & stylist, but for now, I am happy and thankful for this new opportunity. I always think there is many given chances throughout our lives and this is one of it! I am really enjoying the fresh green everywhere around me! 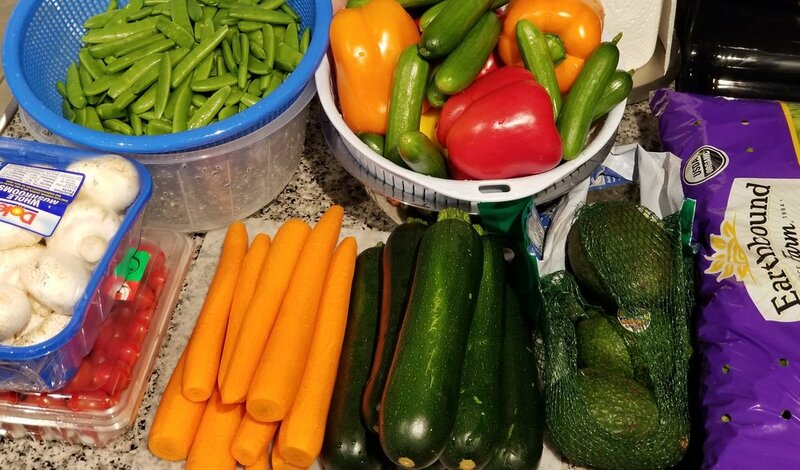 Call me crazy, but I am so fascinated by preparing my veggies nowadays that I can stand in the kitchen all day long. Knowing this will last me only less than a week, and I have to do it all over again, but I am still happy! I know it's not easy, but make it a habit, eat healthy, live healthy, and be happy! I had been really busy, but I promised myself to make a visit to the UW this year for the cherry blossom and so we did! My bestie tagged along with us! I went this day (March 18, 2018) because media had said it was going to be full bloom but not quite. We still took pictures and walked around the campus for a bit. It was pretty chilly at 7 AM but well worth it with a lot less crowd. 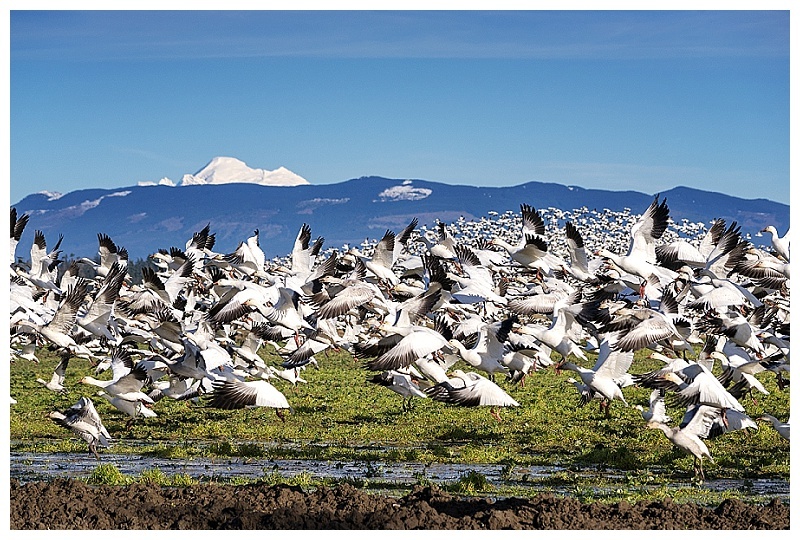 How many of you drive up to Skagit Valley for snow geese viewing? My husband and I used to drive up there during the season every year, but since my surgeries, we have not been back. So this new year, on a really nice sunny January Sunday, my hubby and I packed lunch and drove up to Skagit Valley. I know many people do drive up there for Tulip Festivals and sometimes people get lucky to spot them but they are kind of hard to find and people mistaken with Trumpeter Swans. Snow geese are massive, I mean uncountable massive group. This is why I LOVE Washington. We live in a paradise people!! !